Arctic News: How Do We Act in the Face of Climate Chaos? Really? One MOX fuel rod will kill 3 billion people in a few weeks? Is there a credible source or is this anti-nuclear alarmism. The post contains a link to Christina Consola's report, which gives some further details regarding the gravity of the situation and also lists her credentials. I think it's clear that the situation in Fukushima is very worrying. In my view, governments should embrace effective and comprehensive action to - among other things - facilitate a rapid shift to safe and clean ways to produce energy. I just read the above mentioned Christina Consola's report. This is not a serious, science based report. This doesn't mean I would favor the use of nuclear energy as a solution for slowing and mitigating climate change, as it is far too complex, and the dangers for nuclear meltdowns is rapidly growing - just in the neighborhood of NY and NJ! I just read the report of http://www.climatecentral.org "the aftermath of hurricane sandy". Frightening prospects! I agree on all other details of your interesting report, the amount and strength of all those feedback loops is impressing and undebatable. Thank you, Sam. Turning the corner on climate change and finding the dead end awaiting us is a bad news/worse news experience. Guy has been holding the message for a year now and it's really time for others (with credibility) to approach it without political agenda. As Guy talks about the 25 feedback loops currently in place and leading us to the firing wall, I hope other scientists whose expertise coincides with the areas covered by these feedback loops will consider them and address them in a public manner. Thanks again. Re: "forested ecosystems do not sequester additional carbon dioxide as it increases in the atmosphere, as disappointingly explained in the 6 August 2013 issue of New Phytologist." You are extrapolating for the whole planet what was observed over a small patch of land under specific circumstances. If Afforestation cannot sequester carbon, then why does Deforestation cause CO2 emissions? I agree with the first reference you cite that Afforestation cannot possibly sequester all the remaining fossil fuel carbon stores on the planet and therefore, we need to get off fossil fuels ASAP, but Afforestation is not an impotent tool at our disposal and it mostly comes for free, if we get off animal products ASAP. It's not clear that all of those feedback loops are underway, from the links given. Some are still being investigated and "only" a few can definitely be thought to have kicked in in earnest. That is still worrying, of course, but if many can't be validated, it would cast doubt over the others, especially in terms of how they will play out. The first highlight from the presentation misses part of the context, where Guy mentions that the data points used by Malcolm Light no longer exist in the data set, and readings over the following years showed much smaller levels of methane, though Guy's phrasing is suggestive of manipulation of the dataset. As the spike hasn't shown up in any of the other stations, it seems likely it was an error or a local, short lived, event. Most of what Guy talks about is very concerning but remember that it is a worst case scenario where every feedback goes at breakneck pace and where business as usual goes on for many more decades. I think there are other possibilities but certainly no room for complacency. 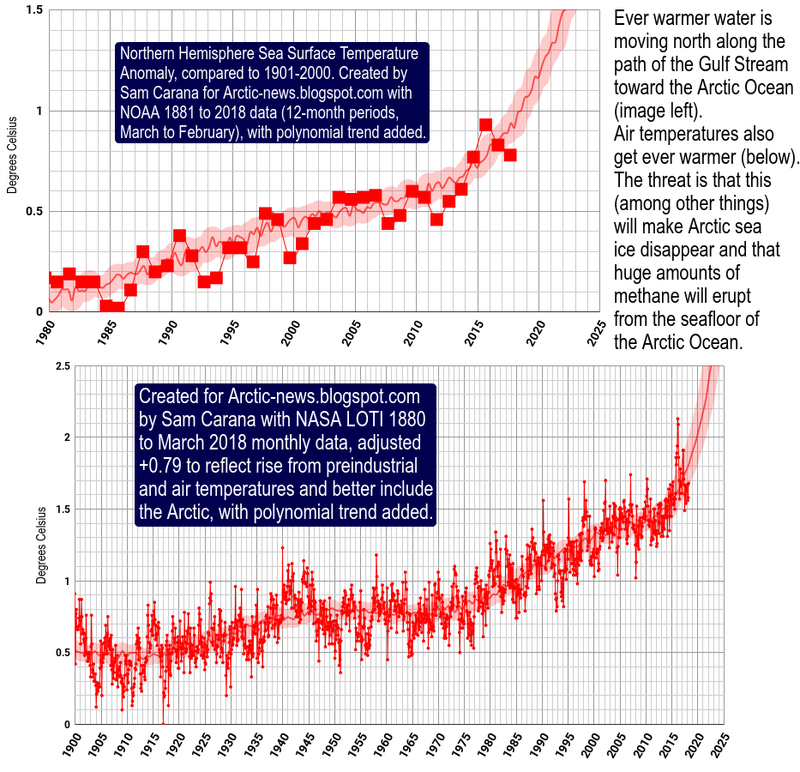 There's no doubt that albedo (reflectivity) is increasingly declining in the Arctic. This one feedback alone is estimated by Professor Wadhams to cause more warming than the net radiative forcing resulting from the emissions caused by all people of the world. 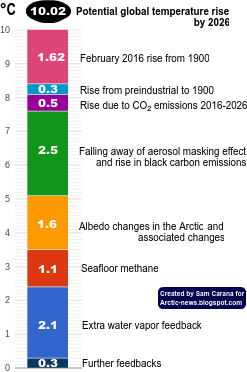 We can count ourselves lucky that there hasn't been more methane entering the atmosphere over the Arctic Ocean as yet, though there are worrying indications that we're running out of luck, so it makes sense to start taking effective and comprehensive action now, rather than to wait until this threat fully eventuates. Guy rightly rejects NOAA's practice of removing data, which can confuse people into assuming they were errors. NOAA collects data from only a few stations in the Arctic, so the Svalbard station covers a wide region. A hydrate that is venting locally can push up methane levels in the flask. In such a case, NOAA can later remove such data, not because they were incorrect, but because they are not seen as regionally representative. Malcolm Light highlighted these data precisely because they are indicative of the impact of methane venting. There's no doubt that methane has been venting close to Svalbard. This had been observed since 2008, followed up by peer-reviewed studies such as this 2009 one. 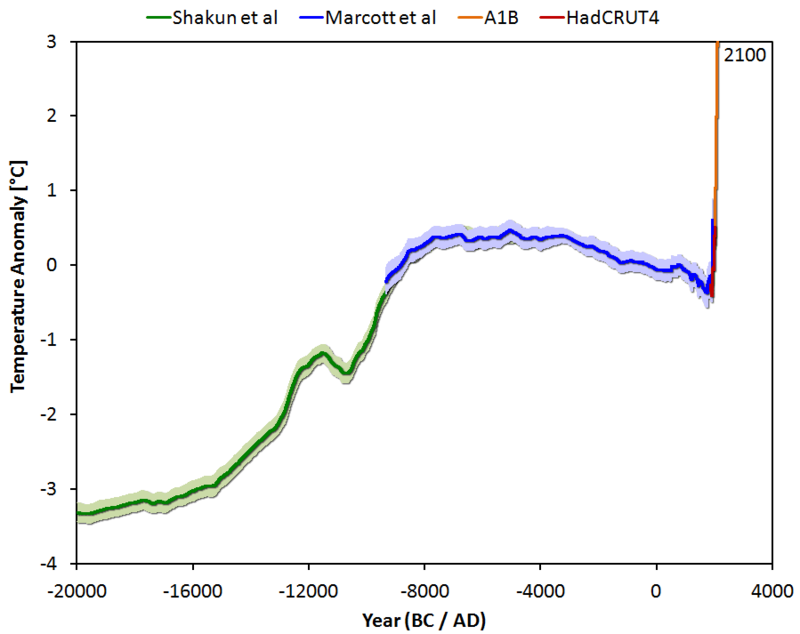 BTW, current Svalbard flask levels fluctuate between 1865 and 1950 ppb, so the peak of 2040 ppb that Malcolm Light used in his calculations is rather conservative. Again, see this recent post to get an idea of what current peak levels are over the Arctic Ocean. In conclusion, just a few of these feedbacks have the potential to devastate the world within decades and Guy rightly sounds alarm bells, the more so since most media refuse to connect the dots. How do we act in the face of increasing climate chaos now that it is essentially too late to alter this. I'd suggest root core change to the force that caused the change in the first place so it stops adding. Nature's isolation from fiduciary duty implied in money needs to be eliminated en mass isolating harm from those elements of the economy worldwide that tend to support reestablishment of open system. Otherwise entropy is forced to rise automatically. And the determination of exactly how close we were to isolating evil from money and the fun of seeing angst in the devils' eyes as the prey is ripped from grasp. Figuratively speaking.